Our search for the perfect pizza started 8 years ago, 1661 miles away. Mr. Crumbs was born and raised on the East coast, home of floppy, foldable (yet still crispy) pizza. When we got married, he relocated to a state where Tex-Mex and BBQ tied for first place cuisine. Of course you could get pizza. But 9 times out of 10, fajitas or steak won out for dinner plans. After a few months of being away from the coast, Mr. Crumbs started going through pizza withdrawals. We tried the typical pizza chains, but according to Mr. Crumbs’ standards, they weren’t very good (for numerous reasons). Being a new wife (and knowing NOTHING about East coast pizza), I wasn’t going to argue. So the quest for the perfect pizza began. We used the internet to search for “New York style pizza” in our area and one by one, made our way through the results. Several of them were “okay,” but none of them earned the title of “I’ll eat here again.” Until one day, we accidentally found a shop that wasn’t on our list. Mr. Crumbs decided to meet me that day for lunch. Dining options by my work were extremely limited, with your choices being either Subway, or whatever restaurant happened to occupy the building across the street. I explained our options to him and when we saw that the business across the street was a New York style pizza shop, we gave it a shot. Compared to the pizza we had been eating, our lunch that day was nothing short of amazing. Thin crispy crust with large floppy pieces, plenty of cheese and a good, tomato-y sauce. Mr. Crumbs gave it two thumbs and after just a few bites, he said (with a mouth partially full) that he would eat there again. Pizza for lunch on Mondays became our new newlywed tradition. That is, until the pizza shop unexpectedly closed. One Monday, we walked across the street as usual. Only this time, the lights were out and no one was inside. We crossed our fingers, hoping it was a fluke. That the owner was sick or they ran out of cheese. It was a sad day in our quest for perfect pizza. Given that we had already exhausted most of the other shops in our area (at least, the ones we felt safe eating at), the hunt was officially on hiatus. If we ever craved pizza, we broke down and ordered Pizza Hut. Although it was never as satisfying as the pizza from that New York shop. 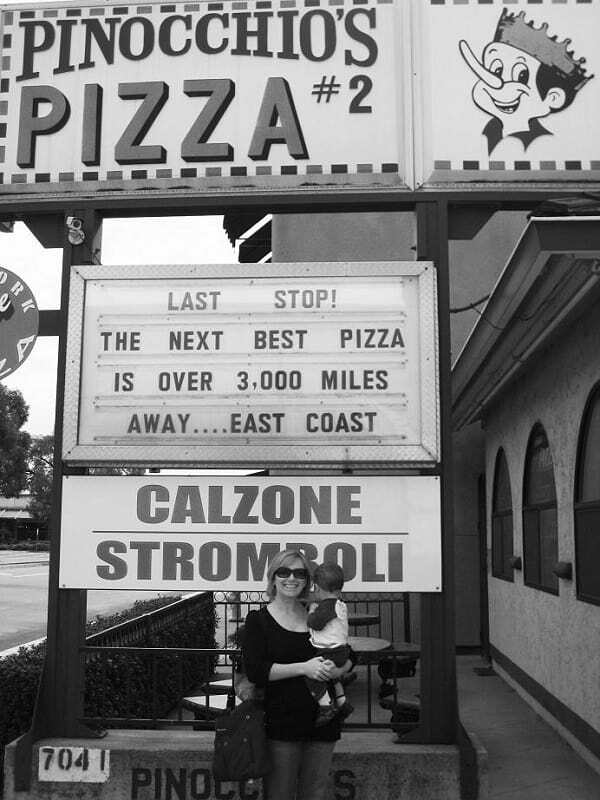 Nine months after the pizza shop closed, we moved 1661 miles away to California. With a completely new area to explore, the hunt for the perfect pizza started up again. We ruled out two major chains and tried three other shops in town, but none of them came even close. Once again, we turned to the internet to find “East coast style pizza.” Except this time, we read every review we could possibly find. We crossed our fingers that someone else from the East coast had already traveled West, done some taste testing and paved a way for the rest of us. As it turns out, someone had! Yep, that’s me with The Boy. He was 17 months old the time and I was five months pregnant with The Girl. Such a sweet picture looking back! We ordered the usual – a large pepperoni – and sat at one of the three long tables inside. No more than 15 minutes later they brought out a piping hot pizza that was exactly what Mr. Crumbs had been looking for over two years. It was love at first bite, and we’ve been telling everyone we know about the place ever since. By the way, if you’re ever in the Gilroy, CA area, this is a must-stop for the best pizza on the West coast (next to our house of course). We visited the pizza shop every month for well over a year, sometimes even twice a month. The Olivari family (the owners) always greeted us with a smile and after a few visits, started making our order without us having to tell them what it was. Visiting them was like seeing family, and we anxiously looked forward to pizza night. On the weeks we weren’t able to make it to the pizza shop, we tried our hand at making it at home. We tried dozens of pizza sauce and pizza dough recipes, but for one reason or another, none of them were as good as the shop. We took the best recipe of the bunch and compared it to the pizza shop. What was different? What makes the dough flaky? Does the dough need butter? Olive oil? What kind of tomatoes do they use? Did they season the sauce at all? Three years later and literally hundreds of homemade pizzas, we have fine tuned both the pizza sauce and pizza dough recipe. Combine warm water, yeast and sweetener in either a large bowl or the bowl of a stand mixer. Allow it to sit and bloom for five minutes. Add semolina and whole grain flours plus 1½ cups all-purpose flour and salt and knead for 10 minutes, or by hand until the dough is elastic and springs back into place after the thumb test. Add additional flour, ¼ cup at a time, as needed for the dough to come together and pull away from the sides of the bowl. Cover with a towel and allow to rise in a warm place until doubled, 1½ - 2 hours. Lightly flour the counter and shape into two round balls. Cover with a towel until you are ready to pound or roll out into a pizza. 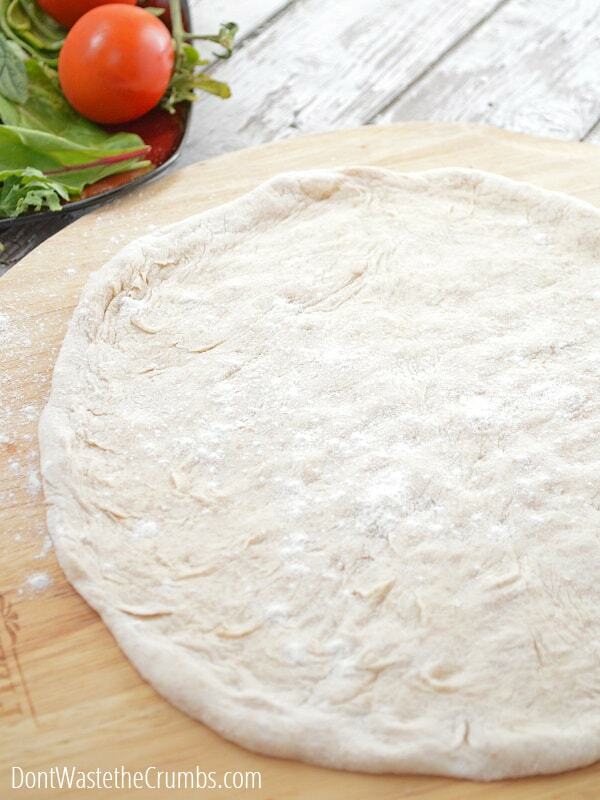 If you want a light pizza crust, don’t add any more whole grain flour to the mix than mentioned in the recipe. That little bit of white flour is needed to give it a light and airy feel. We prefer spelt over the whole wheat, but use whichever you have in your kitchen. To get a crispy crust, you need an exceptionally hot oven and a pizza stone (see below for my recommendation). I preheat our oven to 550F when I start making the dough. This creates a great warm environment for the dough to rise, plus plenty of time for the stone to get piping hot. 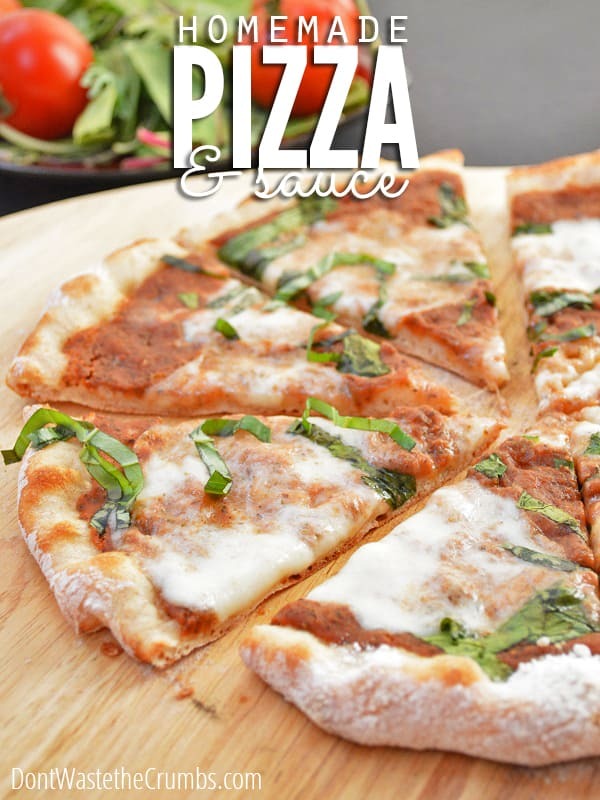 New York Style (East Coast) pizza isn’t every one’s favorite so if you prefer more of a Sicilian type pizza (thicker, more doughy crust), try my focaccia bread spread out over a 10″x13″ cookie sheet, then topped with this sauce and your favorite toppings. 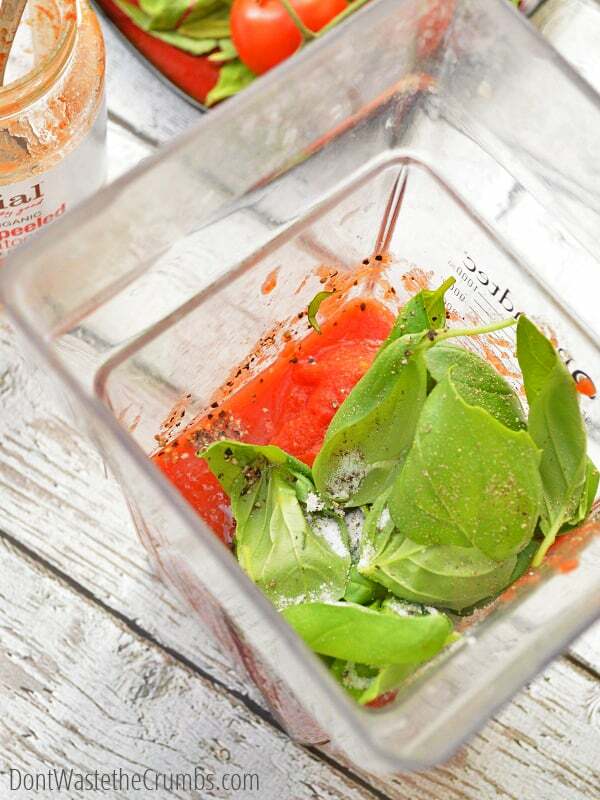 In a blender, combine tomatoes, basil, salt and pepper. Blend on low for 15-30 seconds, or until ingredients are blended well. The key to the a true, delicious pizza sauce is in the tomatoes. Trust me when I say that no ordinary tomato will do, because we’ve tried every single tomato available on every store shelf in our area. I kid you not. When it comes to pizza sauce, you want whole, peeled Italian tomatoes. The tomatoes that come diced, stewed, crushed and pureed take a huge beating in the canning process. (See how it’s done HERE.) Those tomatoes are bred for that beating, so they’re not really flavorful. The whole, peeled tomatoes are naturally sweeter since they don’t have to withstand as many steps in the manufacturing process. The ones from Italy are sweeter still, with the amazing soil and climate available in the area. After trying all those tomatoes, we finally settled on a canned Italian tomato that really was good. Then we discovered these jarred tomatoes and tasted first hand how much the canning process and BPA really affected the taste of a tomato. The taste was night and day! The jarred tomatoes blew our old brand out of the water, and the only other time I’ve ever had a tomato that was as sweet, fresh and natural tasting was when I was eating them off my step-mothers plant last summer. In reality, you can use any tomato you want in this recipe. However, whole peeled Italian tomatoes will always taste the best (unless of course they’re from your garden!). If you’re taking an alternate route, avoid tomatoes that have added water since that will make your sauce runny. Although it’s more difficult, you also want to avoid added citric acid or salt since both of those alter the flavor of the original tomato and might cause heartburn and indigestion. When it comes to cheese, we’ve found that fresh mozzarella sliced thin makes for the best cheese. Other than that, fresh, unprocessed toppings always taste best. We’re still on the hunt for nitrate-free pepperoni, but I hear Applegate makes some that is good. Until I find it locally (for an affordable price), pepperoni is one of the few foods that fall into the 80/20 rule. We’ve invested in a few pieces of pizza equipment over the years. These are by NO MEANS required to have a homemade pizza night, but they do help. They are on the pricey side, so I’m offering them in case you’re needing gift ideas for the pizza lover in your family. pizza stone – This was our first investment piece, and a birthday gift to Mr. Crumbs. We’ve had it for over 6 years and it’s never cracked or chipped. I have friends who have purchased other pizza stones and they’ve cracked after the first use. I’m not saying other stones aren’t good, but after researching, this one came out on top and I’d recommend it to anyone who asked. pizza peel – After reading a bazillion specs on pizza peels, I finally bought this one for Mr. Crumbs for Father’s Day a couple of years ago. It was the only one that was big enough to fit our pies and didn’t have a crazy long handle that you’d find in a pizzeria. This peel is the same one you see in the pictures on this page. We love this thing, and it’s a tremendous help in getting the pizzas both in and out of the oven. serving board – This cool cutting board fits both our stone AND the peel, and it too was given to us as a gift many years ago. In fact, this is one of the few pieces that made the 1661 mile trek to California! 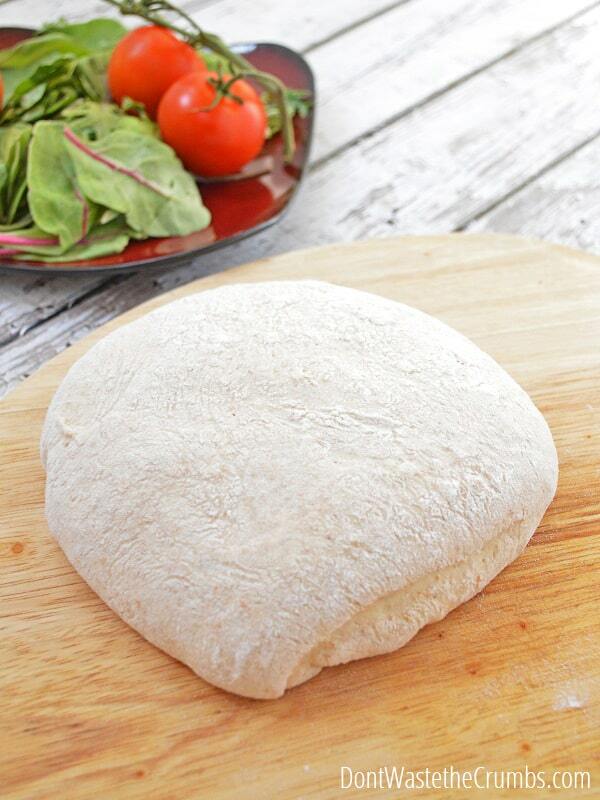 Pizzas go from peel to stone to serving board without any slices or edges fall off. rocking pizza cutting – This amazing pizza cutter was also gift from a friend of ours several years ago. Definitely not a cheap cutter, but I promise you won’t be disappointed. What kind of pizza do you like? East coast, or Sicilian? What are your favorite toppings? LOL, thank you Dena! If you lived closer, I’d have you over for dinner! I tried your link to the Jovial tomato sale. I see pasta, olive oil, etc. but no tomatoes. How do I get to the tomatoes you refer to in your recipe? After reading this post I changed what we are going to have for supper tonight. Pizza it is! I never got the hang of using a pizza stone so I gave mine to my brother and they use it all the time. I use a pizza pan: 17′ diameter metal sheet with lots of little holes in it. 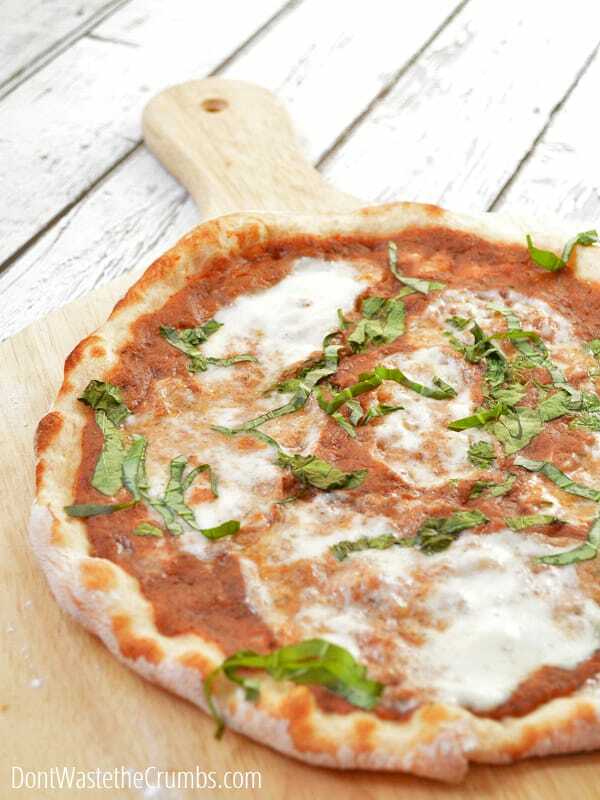 Our pizzas are done to a turn on it (them – I do two at a time) For sauce I use herb and garlic tomato paste, one 6 oz can per pizza. But now I want to start experimenting with your sauce recipe. I say experimenting because we can’t get the same products up here (Montreal) that you can in the States. Here’s to Pizza Fridays! Honestly Alana, I’m not very good with the stone either. The whole move-to-oven thing is Mr. Crumbs’ specialty, but I can somewhat hold my own when he’s out of town. It does take practice though! Hello! I was wondering do you make your pizza right on the peel and then slide it onto your pizza stone? I cant wait to try this one!! Hi Becky! We pound it out into a circle on the counter, gently fold into quarters and place on the peel. Then sauce and cheese quickly, then slide to the stone. Then use tongs (or your fingers if you’re brave!) to move from stone to cutting board. 🙂 Enjoy!!! I loved your story on finding the perfect pizza! So cute and hilarious. Have you tried canning your own tomatoes or sauce? No, but I plan to later this year! This is my first year to grow tomatoes, and we’re hoping to grow enough to enjoy now but also make a few batches of sauce for later! i can’t wait to try this this weekend with the kids. i hope it’s not a total fail first try! i’ll be sure to have a ‘spare’ crust ready just in case! thanks for sharing! Goodness, I hope it’s not a fail too, lol! Remember that one batch of dough makes two crusts, and even if they’re triangle (my specialty) or square pizzas, they’re just as delicious! Aw Katherine! I’d love to meet you if you’re ever back this way! We haven’t tried Pizza My Way, but don’t be surprised if you find a DIY version of their CA Veggie on this site sometime. We love experimenting with new versions! 😉 I hope you like our homemade recipe – please let me know how it turns out! Our local Target sells uncared pepperoni, without nitrites or nitrates. Maybe you can find it there! 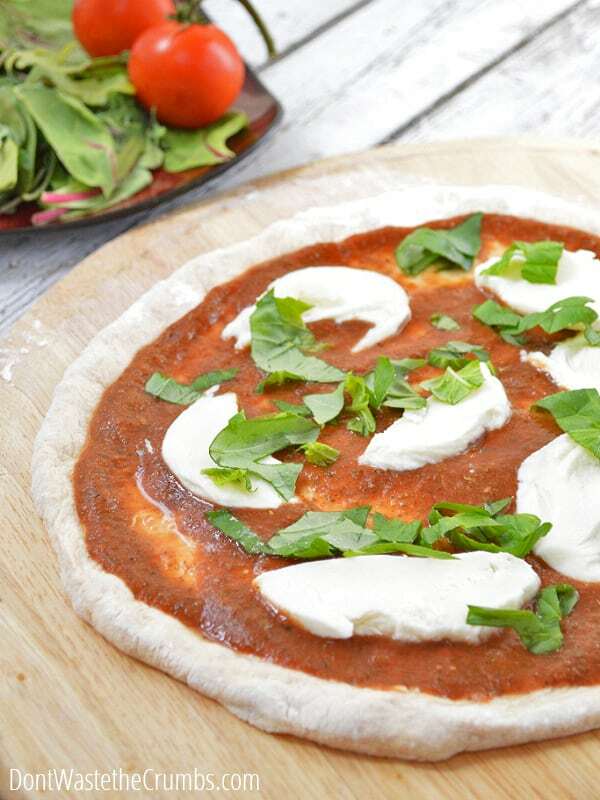 How would you modify the pizza sauce to accommodate fresh tomatoes? Blanch, peel, and squeeze out a little of the juice, then proceed? Any tips would be super – my CSA box is full of tomatoes, and I hate to open a can with fresh on the counter. Hi Erin! 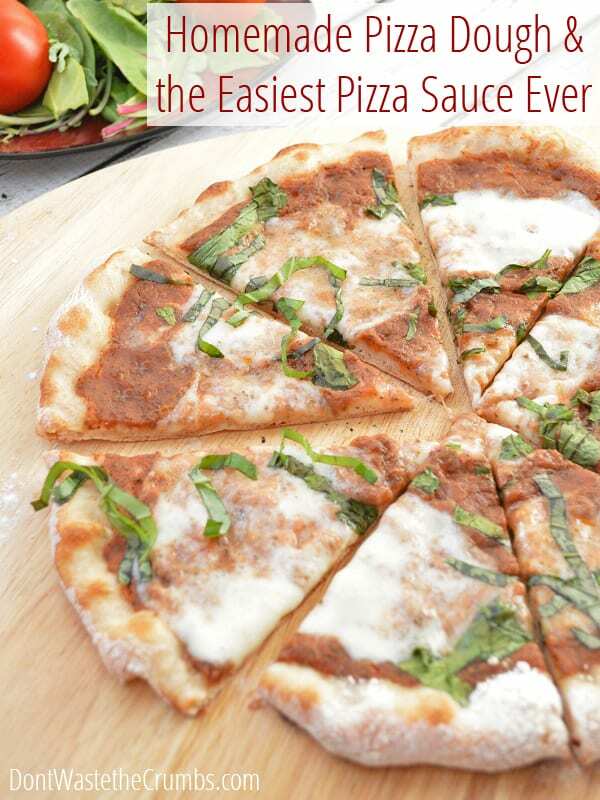 We made our first batch of pizza sauce with homemade tomatoes last week and it was SUPER easy. Simply sub in for the jarred tomatoes and you’re done! It will be a bit thicker in the jar and on the pie, but cooks up very delicious. I’m not sure how many tomatoes you’ll need, so I say fill the blender halfway, blend, and gauge ounces there from there. Enjoy!! Have you tried using all whole wheat flour? Also, do you have to use the semolina? I don’t have that kind of flour and don’t really want to buy another kind of flour. I actually really wanted to try your hot pocket recipe and was wondering if I could use all whole wheat (fresh ground)? Thanks! PS – if you use all whole wheat in the crust, it won’t be quite as flexible when you shape and a bit less fluffy when you bake it. We tried using hard white spring wheat last week and of all the varieties of wheat, that fared best. Can you freeze the dough? Would you freeze before the rise or after it? You CAN freeze the dough, but we weren’t fans of it. We tried freezing after the rise. If we did it again, I’d freeze before, and then let it thaw overnight in the fridge, then a full rise at warm temp before dinner. Those seasoned at freezing dough have done it before, so I’m sure it’s possible! This is the BEST PIZZA EVER!!! I am not exaggerating; my husband, kids, and I were in heaven. Thank you for posting this! You eliminated all sense of trial and error. It is beyond fantastic! We could only think of one pizzareia that we like better than this recipe (east coast, go figure). Had you tried it with brown rice flour and a GF mix instead of wheat flour? If so, how did it taste? I want to try this recipe but am gluten intolerant. Did I miss the step on how long to cook the pizza dough for? And then after you add the cheese and toppings, do you put the pizza back in the oven? How long? Hi Carmen! We top the pizza with sauce/cheese/toppings BEFORE cooking, and cook for 4-6 minutes on very hot, preheated pizza stone. Sorry about that! Hi Lea! Preheat the oven as hot as it will go. I’ve never used baking sheets before, but I’ve heard you can invert them (upside down) and let them get super hot, then use them as you would a stone. Enjoy! Just made this. 5 mini pizzas. So good. I did have to add some flour to my dough, but I’ll double check my measurements next time. We added a bit of garlic powder to the sauce, b/c I have never made a pizza without garlic. Both my girls scarfed down their pizzas and asked for seconds. The crust has just the right tooth to it! 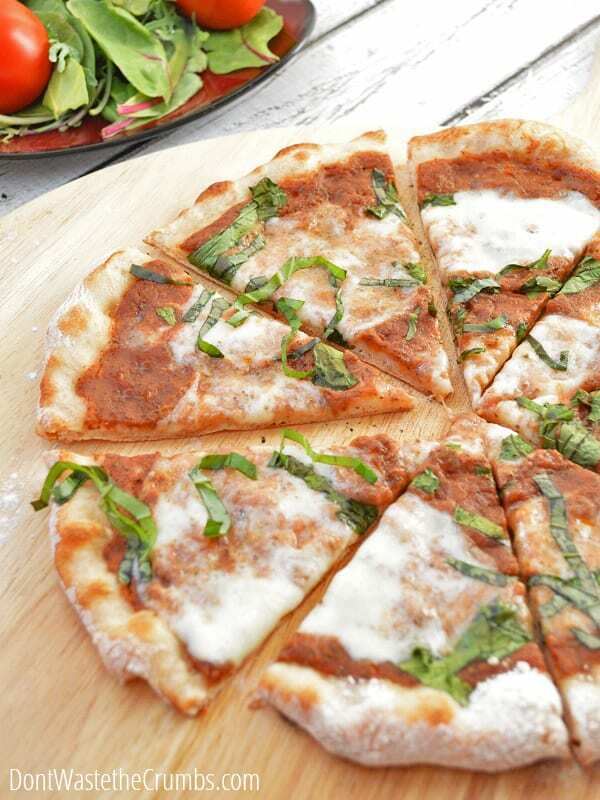 With no sugar in the sauce and minimal in the crust, this mom is in seventh heaven. Thanks for all your experimentation. You’re most welcome Erin!! I’ll double check my measurements too the next time we make pizza. I do this so often, that I stopped paying attention. Glad the family enjoyed the recipe!! Hi Amy – I’m going to remeasure this again the next pizza night we have and update. Sorry for the confusion! My husband and I both had pleasant surprises with this pizza! I was surprised by how flavorful the sauce was with only a few ingredients. My normal sauce is spicier, but this will probably become my new go-to recipe because it’s tasty and a lot easier! My husband was surprised by the crust. As soon as he realized it had whole grain flour in it, he determined he probably wouldn’t like it, but it didn’t take long for him to admit it was really good. We both enjoyed the flavor and the texture–just the right amount of “chew” and crust without being hard. Thanks for the great recipe! Woo-hoo! Thanks for sharing Janelle – so glad you guys like it! I was born and raised in Connecticut, just outside of New Haven, where pizza is religion to some. I never knew our thin crust CT/NY pizza had the name of “East Coast Style”. I moved to Maine 5 years ago and have been in serious withdrawal for “real” pizza like back home. I miss the hot pepper flakes and fresh parmesan sprinkled on top and a crispy crust. In Maine it is very gummy and thick and yeast-y. Plus, I have yet to see anyone fold a slice in half. Sometimes, even though it is still New England, I feel like I am living on an entirely different planet. It’s amazing how one food can be so many different things to so many different regions.. Hahaha! Hi Tiffany, I make homemade pizza all the time, usually every other week for the two of us. We each get our own to suit our “toppings” taste. He likes thicker, I like thinner crusts. I have some good dough recipes but can’t wait to give yours a try soon. I always use some semolina flour in my dough and also in my sourdough bread. I have also made homemade pepperoni. It was good, and very tasty, but a bit dry so I usually just purchase some at my local store. Next time in Target I will look for their uncured pepperoni. I grow my own tomatoes so I will be canning (jarring) some for the sauce. Will this dough recipe be good for calzones also? My guy is a NY guy and not only loves his NY style pizza but also his calzones. I’m surprised at the difference in taste that semolina makes! Yes, this recipe is good for calzones too! Thank you for the recipe, I’m so excited to try it (we have pizza night on Fridays too) and it’s always fun to test out new recipes. I was wondering if you’ve ever read or heard of the book Artisan Bread in 5 minutes a Day? I use it to make our pizza crust but also our baguettes, rolls, and French loaves and it is SUPER easy. Basically you make a big batch of wet dough and store it in the fridge (up to 2 weeks! ) and just cut off a chunk, shape it and let it rise for 20 minutes when you’re ready to bake it. It becomes more of a sourdough towards the end of the two weeks which is awesome. If you haven’t read it you might enjoy it 🙂 I absolutely love it! And has saved me so much time on meal prep days. Happy pizza making! Thanks again for sharing! Hi Roxy! Unfortunately I can’t since I don’t usually weigh ingredients first, but I’m sure there are conversion calculators available via any search engine! Hi Nik – I set my dough on the counter next to the oven to rise. Hope that helps, and enjoy the pizza! Hi Meg! I haven’t done it myself, but I’ve heard that if you just add it all in according to your machine instructions and choose 1 rise, you’ll be good! I’m a little late to the party, having just found this post. When we moved 30 miles south four years ago we also went through withdrawals trying to find NY style pizza, but thanfully, we moved to Gilroy and Pinnochios also saved us. It was so strange to see their sign in your post. I still miss our old pizza place in Santa Clara, but Pinnochios helps fill that hole very nicely. Kenya! Pinnochios was our weekend getaway a couple times a month for a LONG time – they’re such a great family! They watched my son grow up from 8 months old to 8 years, and followed me with kid #2 from pregnancy to 5 years old! The next time you go back, please tell them Mike and Tiffany (from Texas and Delaware, now with 2 kids) say hello!! I got to this recipe via a link in your uses for whey entry. If I were to use whey in this recipe would I just substitute the water for the whey? That would work Angie, although whey is slightly acidic and might change the flavor of the dough. I’d start with a 50/50 substitution first, just in case the flavor of whey is too strong. I did it! I made the pizza dough and sauce yesterday and it was so EASY!!!!! I had the ingredients for a few weeks but was a little apprehensive to try the recipes. I feel so silly now! So easy! I used the dough and sauce to try the homemade hot pocket recipe that you posted, but they turned out more like calzones. They tasted great but the prep was a little too time consuming for me. Next time, I will just make pizza!! So glad you liked it Shannon!! I agree that the hot pockets are time consuming. Hopefully we can work out an easier recipe for that! Could this be done in a bread machine? It can Natalie, but I’ve never done it myself so I don’t know the conversion. The peel you recommended is no longer available! Is there another one you would recommend or certain features you would look for? Thank you! Do you have any advice for making this ahead? I feel like our schedule requires a couple more hours of waiting than your recipe calls for, and trying to figure out if it’s still possible to use this? Hmmm… I bet you could put the dough in the fridge first, and then when you have the time, continue with the first rise as written. That won’t harm the process, just retard the initial rise. Ended up making this today when we could follow the recipe as written. SO good. My new go-to pizza dough! Hi! If I left out the semolina flour should I sub something in for it or leave it out completely? I’m itching to try this but no stores around me have it and i don’t feel like ordering the flour and waiting for it to arrive. Sub with whatever other flour you’re using and you’ll be fine!